This article contains steps to solve the problems when using Auto PIN number. Auto PIN: Authorized PIN is a 4-digit number that is used to access a door when there is keypad reader installed. Anyone set of the Auto PIN can be used to access a door. Auto PIN Operation Mode allows user to access a door without the needs to use card. › Enter Auto PIN number but cannot access the door. › Get "Invalid PIN Access" transaction at the software when enter Auto PIN number at the reader. › "Invalid Pin!" shown at the Plato reader’s LCD screen after enter correct Auto PIN number. › Door is not release after enter correct Auto PIN number. › Incorrect Auto PIN number was entered. › Auto PIN number was not installed at the software database. › Auto PIN number was not downloaded to the controller during the installation. › No communication between controller and reader. › Make sure the Auto PIN number has been installed at the xPortal Client software. › Make sure the Auto PIN number is downloaded to the controller during the installation. › Make sure the reader is properly connected to the controller. › Make sure the controller is connected to the software and communication is up. Perform steps below to solve the problems. Login to xPortal Client software. Make sure your controller is up before you proceed. Enter the Auto PIN number. You have 10 available slots for Auto PIN. "Valid PIN Access" transaction will be shown. There are 10 slots ID No which is reserved for Auto PIN number. You will not see your Auto PIN number from the transaction list when access the door. This transaction only applicable to XP-M1000i and XP-M2000i controller. The other controller whcih support this feature will get "FFFFFF" transaction as shown below. Please make sure the reader is properly connected to the controller. 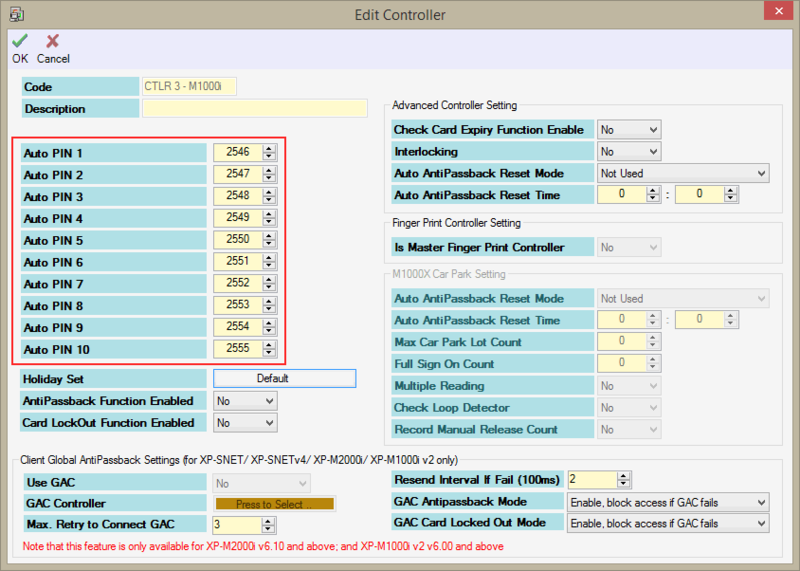 How to configure network setting for XP-M1000i controller? How to configure network setting for XP-M2000i controller? Summary: AutoPIN Operation Mode allows user to access a door by supplying a valid four-digit AutoPIN without the needs to use card. This article contains steps to solve the problems when using Auto PIN number.